Leger Wanaselja Architects laid to rest the notion that shipping container homes have to look like homes made of shipping containers. This home incorporates three 40-foot shipping containers – two stacked together and one cut in half, then stacked – into the 1350 square foot design. 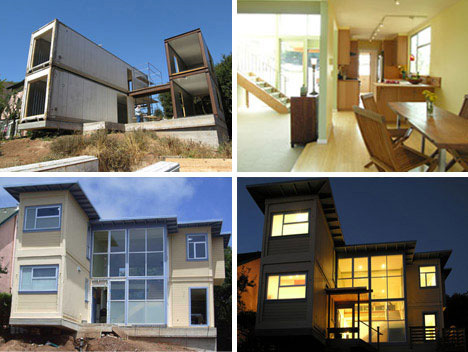 Using the cargo containers for part of the home is like having pre-made rooms inserted into a construction project. Besides taking some containers out of the waste stream, this method cuts down on construction costs and time.